WATERLOO – The Vancouver Film School and Wilfrid Laurier University have struck an exciting new partnership that lets students from both institutions earn a Diploma in applied film skills and a Bachelor of Arts Honours degree in film studies in just four years. 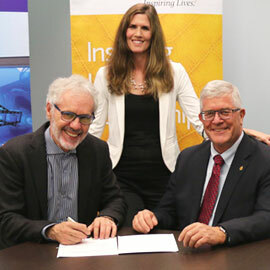 Laurier President Max Blouw and VFS President James Griffin met Thursday, Sept. 22 to formally sign the agreement. Also in attendance were Michael Baser, head of the VFS Writing for Film and Television program; Philippa Gates, Laurier Film Studies professor and program coordinator; and Richard Nemesvari, dean of Laurier’s Faculty of Arts. The VFS-Laurier Pathway is open to graduates from one-year VFS programs such as Film Production, Writing for Film and Television, and Acting for Film and Television. Diploma graduates can proceed to the second year of Laurier’s Film Studies Honours program. In reciprocation, third-year students in the Laurier Film Studies program can attend VFS as part of an applied-media exchange year, and be eligible for the school’s Excellence in Media scholarship. The VFS-Laurier Pathway agreement, made between private and public institutions respectively, is among the first of its kind in Ontario. The agreement reflects the desire of both partners to provide students with innovative, relevant and high-quality learning opportunities. Laurier’s Film Studies program is considered one of the top film studies programs in Canada. Films and visual media play a prominent role in our experience of the world today and the Film Studies Program at Laurier addresses that experience with an emphasis on international film history, film industries, the art of film, and individual films as texts. Our students benefit from our ongoing community engagement, including relationships with Kitchener-Waterloo’s Multicultural Cinema Club and the Grand River Film Festival. Based on the certainty it was possible to learn film production skills much faster than taught by traditional university programs, Vancouver Film School opened in 1987 with 12 students as the world’s first full-time immersion film program dedicated to comprehensive skill development. Building on this model, VFS has introduced “first in the world” production programs in classical animation, 3D animation, new media, sound design and camera-based acting, and now offers 13 one-year diploma programs in Film Production; 3D Animation and Visual Effects; Classical Animation; Animation and Concept Arts; Game Design; Programming for Games, Web & Mobile; Sound Design; Foundational Visual Art and Design; Writing for Film and TV; Makeup for Film and TV; Acting for Film and TV; and a four-month Acting Essentials course.